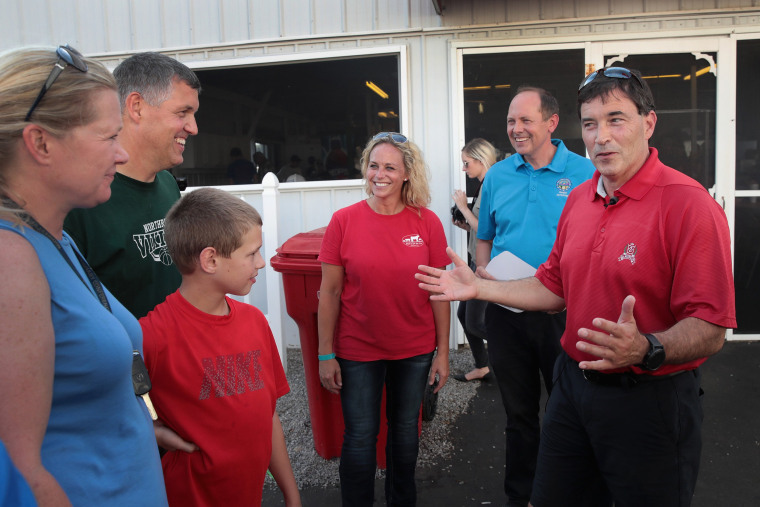 The special election pits Republican Troy Balderson against Democrat Danny O’Connor. President Donald Trump won OH-12 by 11 points in the last election, but — as we wrote last week — Democrats have over-performed in this cycle’s special elections by an average of about 12 points. That sets things up for a very close race, as recent polling has confirmed. We’ve also got this question: If Balderson falls short, who do Republicans blame? Balderson himself, for somewhat lackluster fundraising and an 11th-hour flub? (see more on that below). Ohio Gov. John Kasich, for publicly questioning Trump’s campaign visit? Or the president himself, for hurting the party with the kinds of voters — affluent college graduates and women — it needs to succeed in places like this suburban Columbus district? There would certainly be plenty of blame to go around, but there’s no denying that this race is close for one reason: Trump. 2. How do Trump-endorsed candidates fare? Trump’s been on a primary winning streak lately, but he’s got less of a strong track record of endorsing in elections that pit Republicans against Democrats (See: Roy Moore, Ed Gillespie and Rick Saccone). A Balderson loss would be another black eye for Trump, particularly since the president appeared at a rally for him over the weekend. In primary races, Trump has endorsed John James in the Michigan Senate race, Bill Schuette in the Michigan governors’ race, and — just yesterday — Kris Kobach in the Kansas gubernatorial primary. 3. Do Democrats get their wish — and get to run against Kobach in Kansas? Democrats may not be able to believe their luck if Trump-aligned Kris Kobach wins his challenge against sitting Gov. Jeff Colyer — which may be more likely after Trump’s last-minute endorsement of Kobach yesterday. They think a nod for Kobach, who’s attracted national attention for his harsh rhetoric on immigration and voter fraud, would put winning the state’s governorship within reach — and galvanize Democratic voters in the state’s two close congressional races. The likely Democratic candidate, by the way, is State Senator Laura Kelly. 4. Who wins out in the EMILY’s List vs. Bernie Sanders showdown in KS-3? We wrote yesterday about how the fault lines of the 2016 Democratic primary have lived on in 2018 contests that pit EMILY’s List candidates against those backed by Sen. Bernie Sanders.The six-way Democratic contest to take on vulnerable Republican Rep. Kevin Yoder features yet another potential showdown between the two groups. Attorney Brent Welder has benefitted from the backing of Sanders and Alexandria Ocasio-Cortez, while Sharice Davids, who is Native American and openly gay, has been backed by EMILY’s List. There’s also a centrist in the top three, too; teacher Tom Niermann has been touting the endorsement of a Republican state senator. 5. How does Sanders-backed Abdul El-Sayed fare against favorite Gretchen Whitmer? Speaking of EMILY’s List vs. Sanders … Former Senate Minority Leader Gretchen Whitmer (and EMILY’s List endorsee) is the favorite to win the Democratic nomination for Michigan governor. Muslim-American Abdul El-Sayed has gotten a lot of buzz lately after winning Sanders’ backing, particularly because of progressive energy around policies like statewide universal health care, which El-Sayed has endorsed. But many Democratic observers think he ultimately may have lacked the campaign resources to translate that momentum into enough of a late surge to beat Whitmer, who led by a comfortable margin in our NBC/Marist poll last month. Also in the race is businessman Shri Thanedar, who’s spent the most on ads. On the GOP side, frontrunner Bill Schuette, the state’s attorney general, will have to get by a challenge from Lt. Gov. Brian Calley. 6. Who will take on Dino Rossi in WA-8? Democrats are jostling for the chance to take on Republican candidate (and former Senate and gubernatorial candidate in the state, too) Dino Rossi in this open seat — one of 23 Republican-held districts that voted for Clinton in 2016. The three Democratic frontrunners are public health official Shannon Hader, attorney Jason Rittereiser and pediatrician Kim Schrier. We’ve devoted lots of ink here at First Read to the records being set by female candidates for the United States House this cycle. But women are also performing strongly in some of the country’s most contested gubernatorial primaries, too. So far, six Democratic women and three Republican women have won primaries for governor — for a total of nine nominees so far. That’s likely to go up today, with Democratic women favored to win in both Michigan and Kansas. The record to beat, according to the Center for American Women and Politics, is 10 female total gubernatorial nominees, which happened in 1994, 2002, 2006 and 2010. The record for a single party’s female gubernatorial nominees in an election year is nine, which Democrats hit in 2002. Democrats are optimistic that they’ll break that record by the end of this primary season, too. From NBC: “Prosecution witness Rick Gates, a former business partner of Paul Manafort, testified Monday that he joined Donald Trump's former campaign chairman in committing crimes. "Did you commit any crimes with Mr. Manafort?" prosecutor Greg Andres asked.